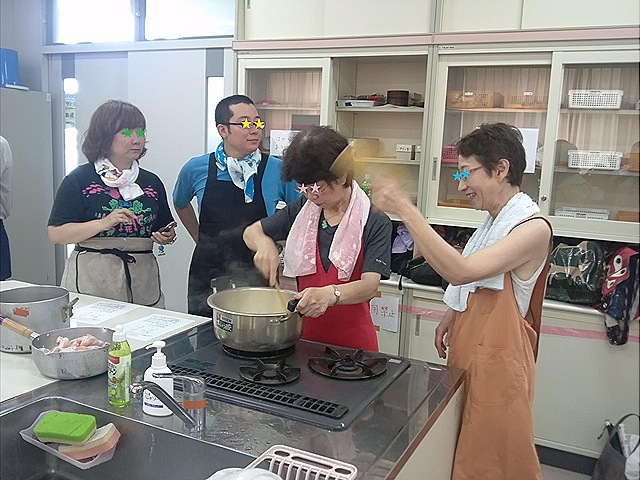 The Bangladeshi curry class is led by some members of Japan Bangladesh Cooperative Society. Although I took the class five times, I have never met a Bangladeshi there but some Japanese members of the NGO and a Seychellois. Seychelles is a country officially called the Republic of Seychelles comprising more than 100 islands in the Indian Ocean. I think it is very rare to come across a Seychellois in this Far Eastern island country. He is Jean. 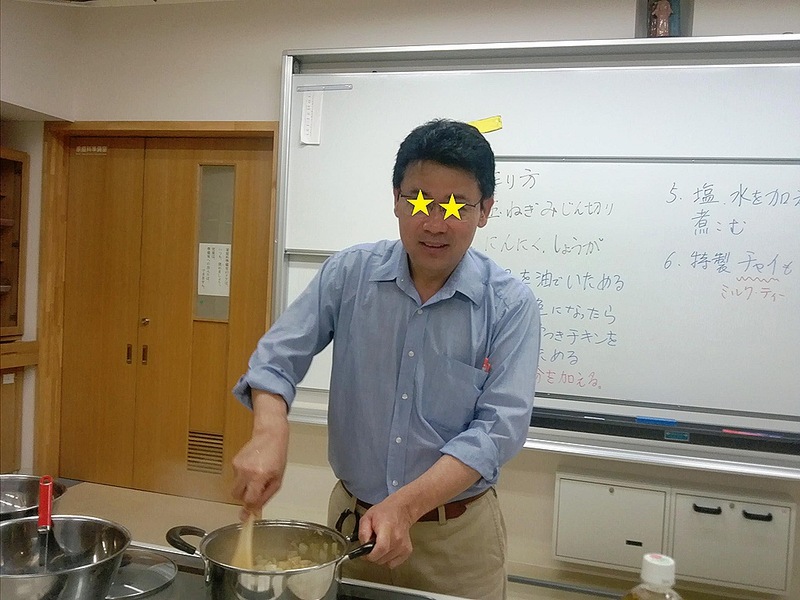 He teaches English, economics, and Chinese philosophy in a university, and of course, teaches how to make delicious Bangladeshi curry in the cooking class. How interesting! 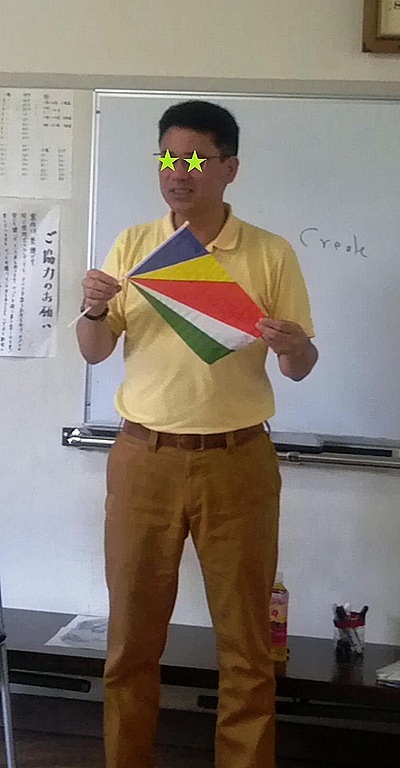 You know, he is from Seychelles and studies Chinese philosophy in Japan! I wanted to listen to him more and I thought I should not get his story all to myself at the same time. Then a light bulb went on over my head. 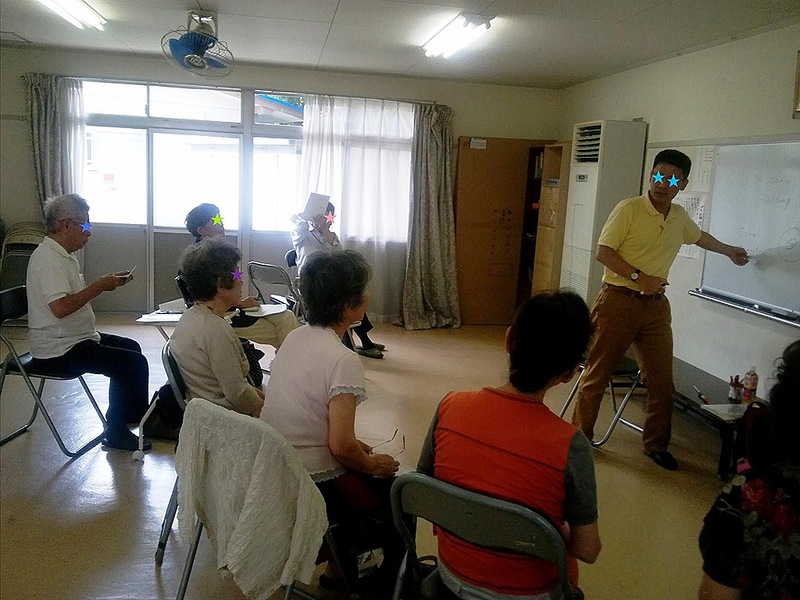 I have a small English club in my neighborhood and teach some senior citizens once a week. I decided to invite him as a guest to the club. In fact, one year had already passed since they had an opportunity to talk with an English speaker. (The episode is here: “An Event at a Small English Club: When is the next session?”) I was sure they would be glad at the meeting. It was very kind of him that Jean agreed readily to come to the club. The session was held on the second Wednesday this month. Seven members came to the club that day. The average age is around 75. The oldest person is an 83-year-old lady. The youngest is probably 63. 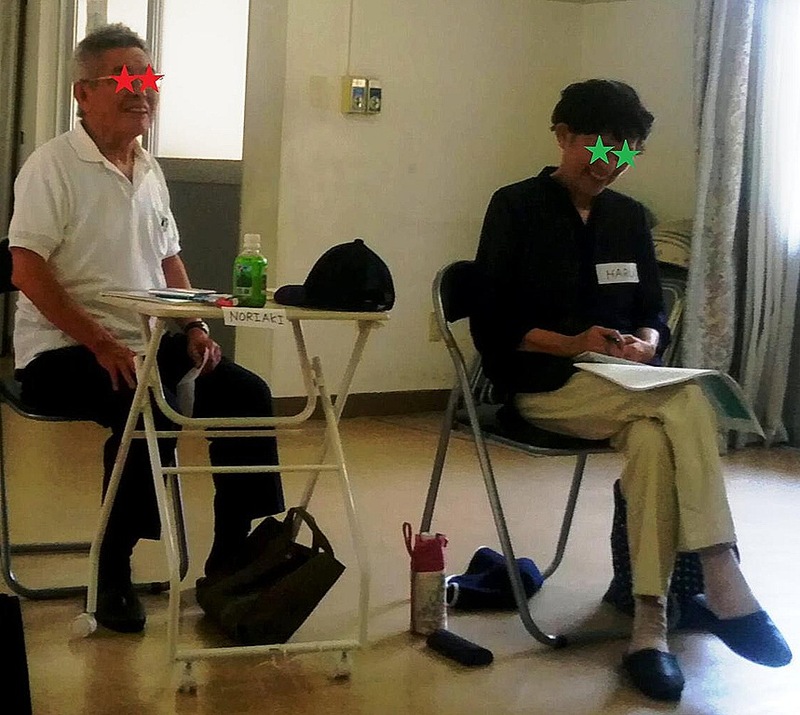 Although one is a patient of Parkinson disease, one is recovering from a stroke, one has poor lung function, one is suffering from a spinal canal stenosis, and two of them have panic disorders, those elders and betters are flexible and curious, and enjoy their lives. So, they were waiting for Jean’s arrival in their excitement that morning. Jean entered the room in applause. The senior citizens looked a little nervous in the beginning, but soon all of them were attracted by his interesting stories and came out of their shells. They looked very happy during the meeting. 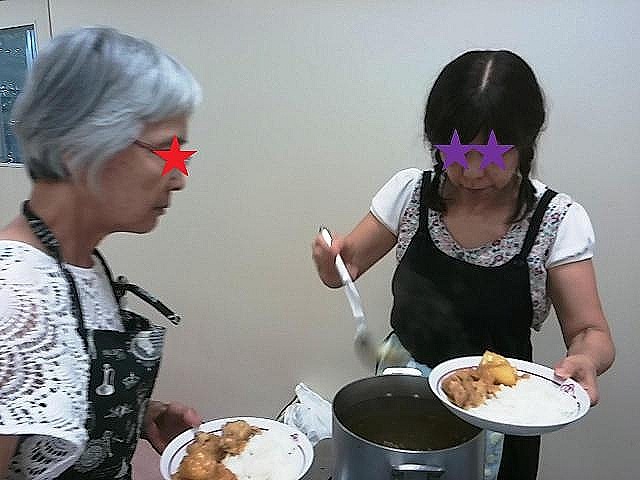 I was also very happy to see them excited with their starry eyes. They were enjoying like children. Pleasant hours fly past. Finally the time came when they had to say goodbye to Jean. While the others were saying goodbye and thank you to him, one of them ran up to me and whispered, “Teacher, Teacher, Jean is gentle and good-looking. I like him.” “Ha ha. I knew you would say that!” I winked at her. Actually, the rest of ladies came to me later and left similar comments. 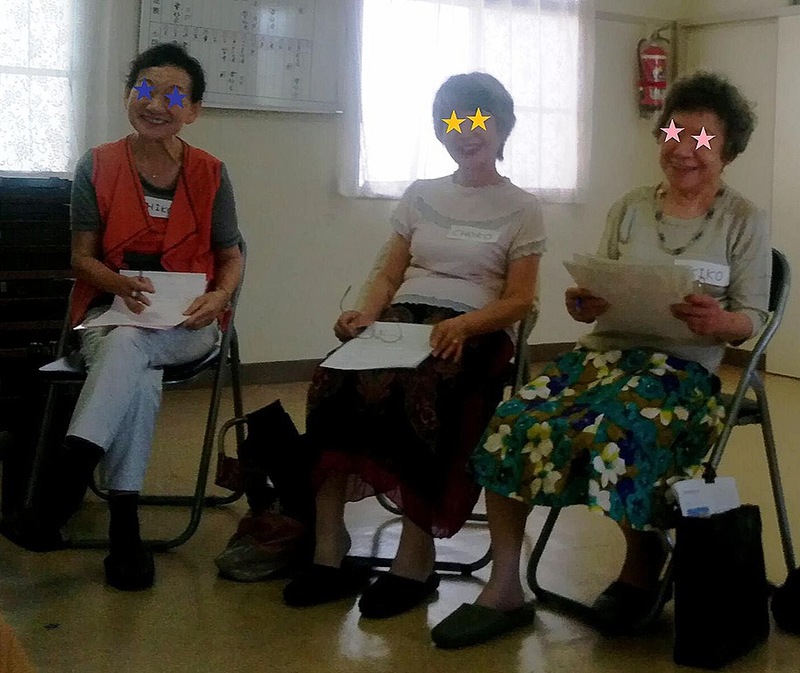 It seems that Jean has not only boosted the elderly people’s motivation for learning English, but also pierced some senior women’s hearts with shafts of love! 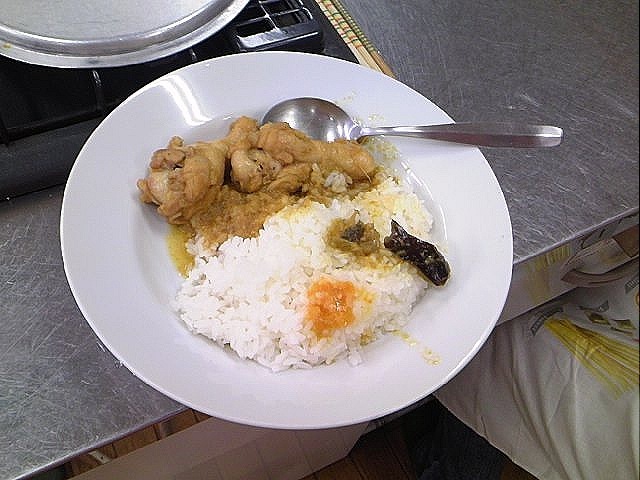 Aichi Summer Seminar 2012: Interesting Bangladeshi Curry Class without Bangladeshi "Yummy!" “I’m very happy to see you again, Jean-san! But I’m a little bit sad today…” When I found Jean at the room, I greeted him. To my delight, he remembered me. 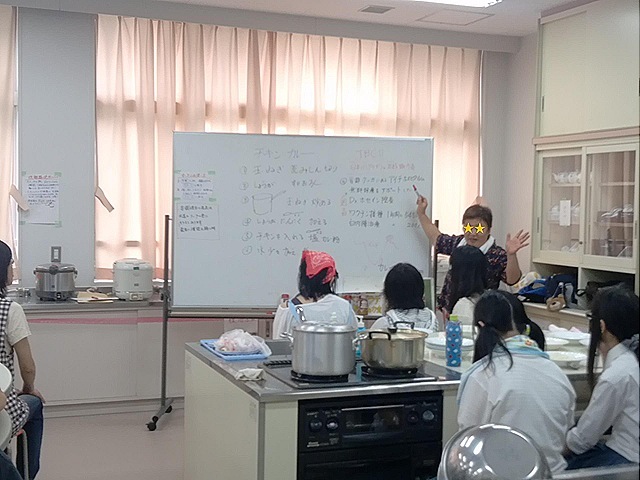 I was in a cooking class of Aichi Summer Seminar, which is called a dream school with more than 1,500 classes held at a private school in Aichi Prefecture every July, and was held at Toho High School and University this year. The reason why it is called a “dream” school is because anyone can teach anything and anyone can take any classes for free there. It began 24 years ago and many people enjoy the dream school every year. 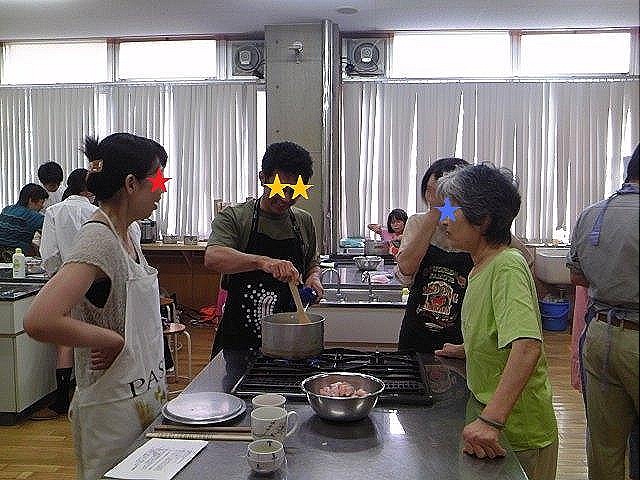 I first took part in Aichi Summer Seminar four years ago, when my first experience there began at a Bangladeshi curry class at Doho Gakuen High School. Since then I’ve looked forward to taking the same curry class every summer. “Why are you feeling sad?” Jean asked me wonderingly. 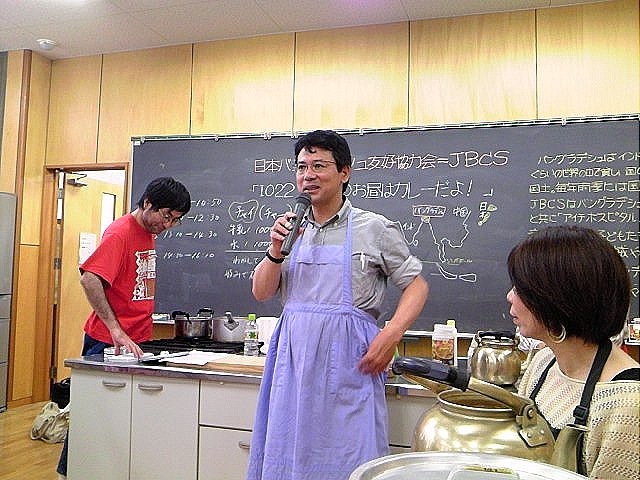 He is an assistant of the curry class. Actually, the Bangladeshi curry class has always no Bangladeshi. Jean is from Seychelles and other staff is all Japanese. Interestingly it’s much rarer to meet a Seychellois than seeing Bangladeshis in Japan. He remembered me because I had taken the class for four years in a row and there is another reason. 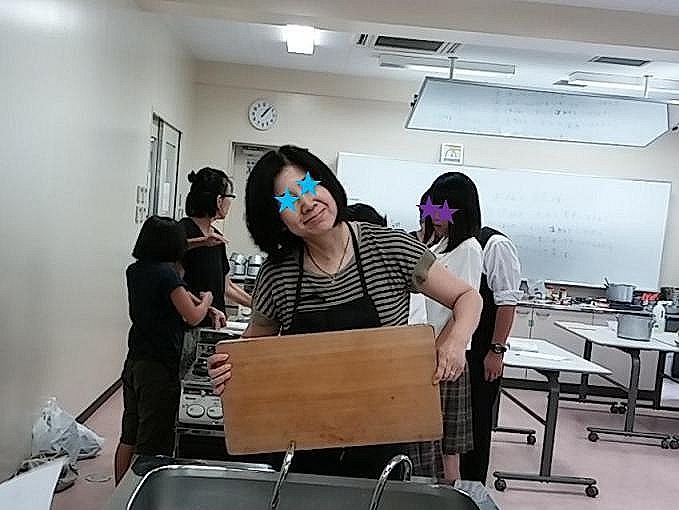 When I joined the class for the first time four years ago, a very cheerful and funny woman was included in my cooking group. Although it was our first time to meet, we instantly became familiar to each other. 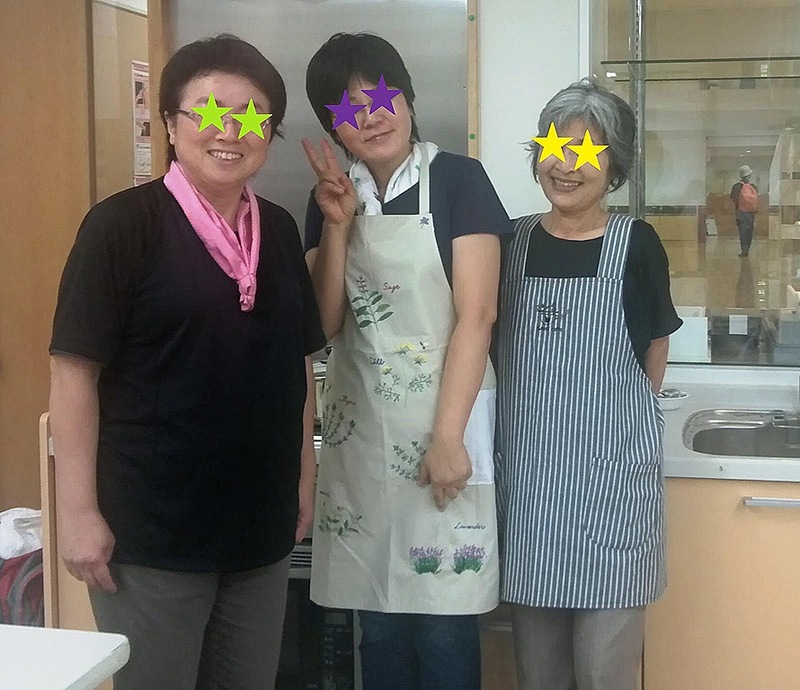 Until last year, we had always been in the same group and enjoyed cooking curry together. I had expected to see her this year, too, but she was not there. “Because that woman is not here today,” I replied to Jean, “You know, that woman…I don’t know her name…just a moment…” I took some photos from my bag and pointed the woman on one of them. “I mean, she…I don’t know her name, though.” Jean was surprised and looked at me, “Aren’t you friends?” “No. I don’t know even her name. We just cooked together in this class every year. I had thought I could see her this year, too…” Jean nodded and said, “Ah…I assumed you two were friends…” I was disappointed not to see the woman, but I enjoyed the class this year, too. 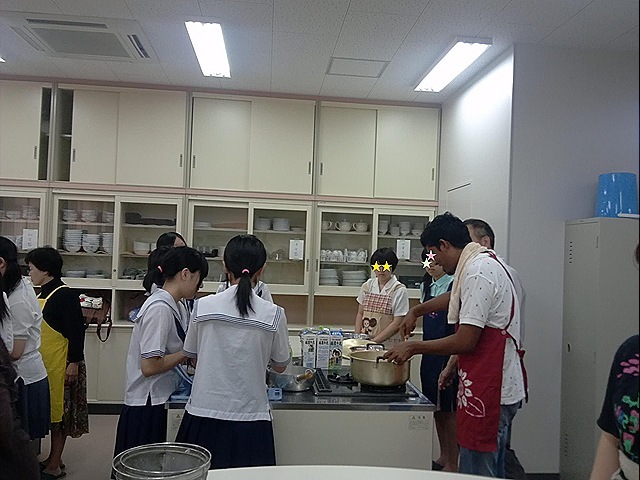 I attended this year with three of my friends, and we made a cooking team with a couple. It was a cooking class, but there was not anything special for us to do except for stir-flying chopped onions until brown. So, we fried the onions in turn. It is a monotonous work, but is very important. You need to fly onions until brown avoid scorching. If you don’t, the curry won’t become so delicious. 1. Rinse chicken with water, chop two onions, and grind ginger and garlic. 2. Heat oil in a pan, and stir-fly the onions until brown. 3. Add ground ginger and garlic, curry powder, and salt, stirring for 5 minutes. 4. Add chicken and stir for 10 minutes. 5. Pour just enough water to cover the content and cook with a lid for 30 minutes. When I wasn’t stirring onion, I had nothing to do apart from fanning my friends who were at the stove. Then I found a man who didn’t look Japanese in the class, and asked him, “Are you from Bangladesh?” He replied laughing, “No! 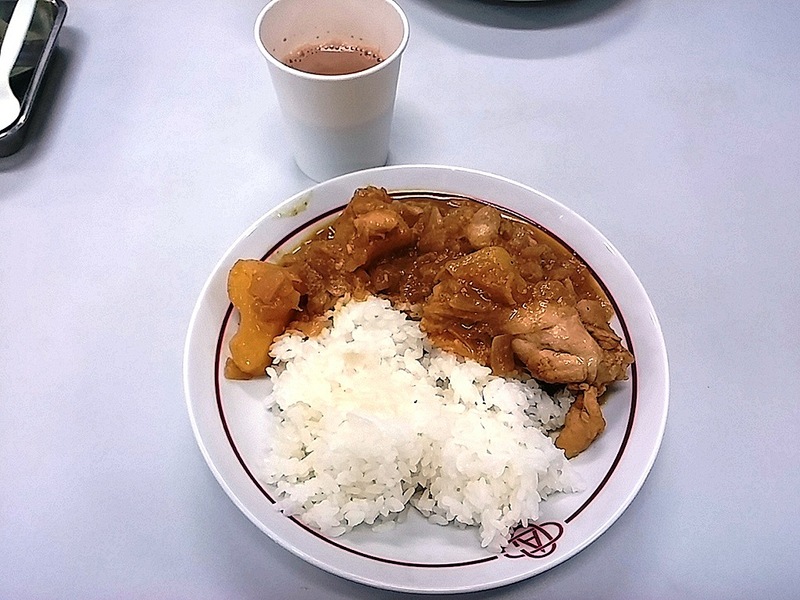 I’m from Maldives.” The Bangladeshi curry class had Japanese, a Seychellois, a Maldivian but no Bangladeshi. Interesting! The class was organized by a NPO called Japan Bangladesh Cooperation Society (J.B.C.S), which plays an important role in building hospitals in Bangladesh. In the class, the participants learn not only cooking but also Bangladeshi situation. Although there weren’t any Bangladeshi people in the class, I came to know many things about their country through cooking. The curry was, of course, very delicious! After the curry class, my friends and I took a pastel drawing class together. It was the first time for all of us to draw pictures with pastels. We enjoyed do the drawing with lots of pastel’s tender colors. Both of drawing pictures and pastel colors seem to have healing power. We were able to relax and had a wonderful time in the comfortable atmosphere. I’m going to take part in the dream school next year, too! 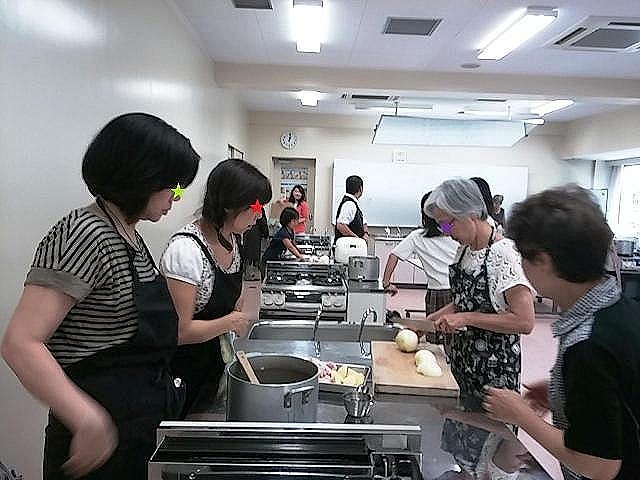 Aichi Summer Seminar 2011: Joyful and delicious Bangladeshi curry class! 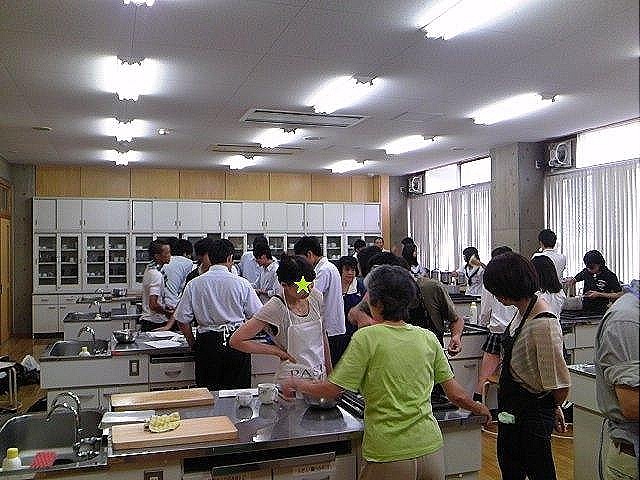 This is the kitchen at Tokai High School in Nagoya. I took part in an annual event called Aichi Summer Seminar with some of my friends. This event has more than 1,000 classes every year and you can learn many different things for free or at a low price. It was two years ago when I discovered such a wonderful event. Since then I’ve taken a class of Bangladeshi curry, and it was my third time to see her in the class this year. We found out that she was wearing the same shirt last year as she had worn it two years ago, and then she promised me that she would wear the shirt next year, too. I was very happy to see not only her but also Jean there. He’s a mini-celebrity. He is the only Seychellois in this area of Japan. That’s why he is sometimes interviewed on TV. I hadn’t seen him since we met first in this curry class last year, but he also remembers me. Actually, there were no Bangladeshi people in the class. So, I thought Jean was Bangladeshi at first. No Bangladeshi but Seychellois and Japanese in a Bangladeshi cooking class. Anyway, the class was fun and very interesting and made the participants so happy. Needless to say, the curry was so nice and delicious! 2. Heat oil in a pan, add chopped onions, stir-fly until onions become brown. 3. Add ground ginger and garlic, curry powder and salt, stir-fry 5 minutes. 4. Add chicken and fry 10 minutes. 5. Add water, shimmer, covered, for 30 minutes. Actually I don’t know the name of the lady who was wearing the same shirt as last year, and she doesn’t know my name, either. But we promised to meet each other at the curry class next year, too. She also promised me to wear that shirt again! “I have other clothes!” She yelled that and we laughed. 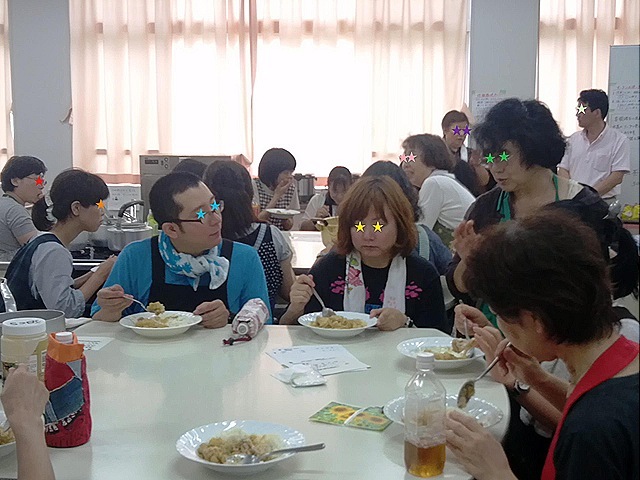 That was one scene at a class of Bangladeshi curry…There was an interesting event named Aichi Summer Seminar the other day. 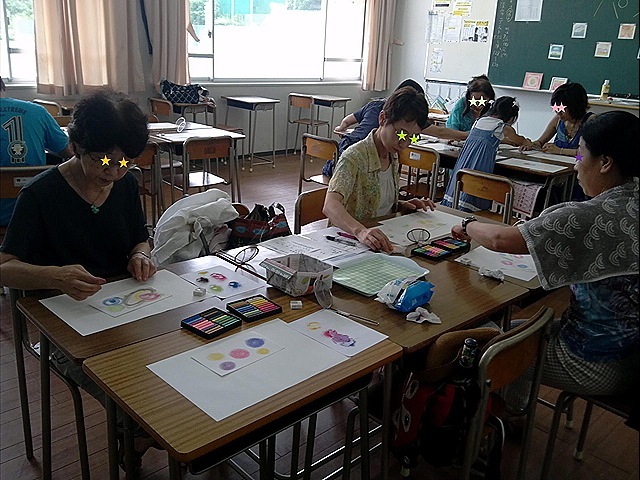 It is held every summer at a private school, which rotates every year, in Aichi prefecture and anyone can teach and study what they like there. 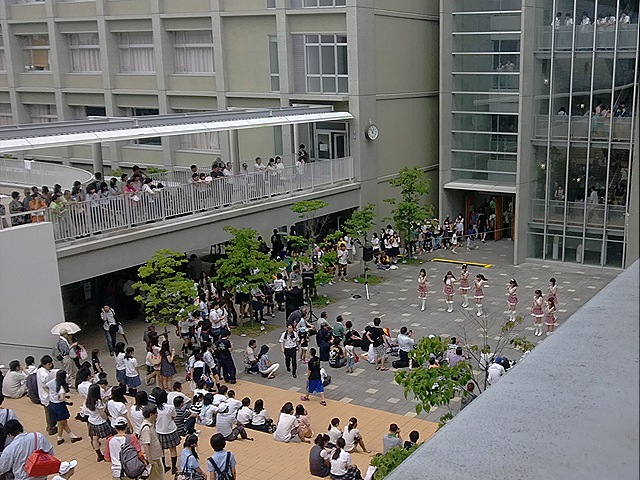 It was held at Sugiyama Jogakuen High School and the department of dentistry at Aichi Gakuin University this year, and had more than 1,400 classes. The event was on August 17, 18, and 19 this year and I took part in it on 19. 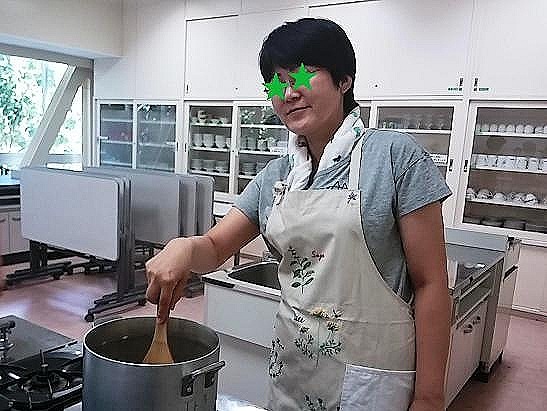 I took a cooking class of Bangladeshi curry at the first period, a class of scene voice at the second period, a Chinese language class at the third period and a Tai Chi class at the fourth period that day. Actually I took the same Bangladeshi curry class last year. 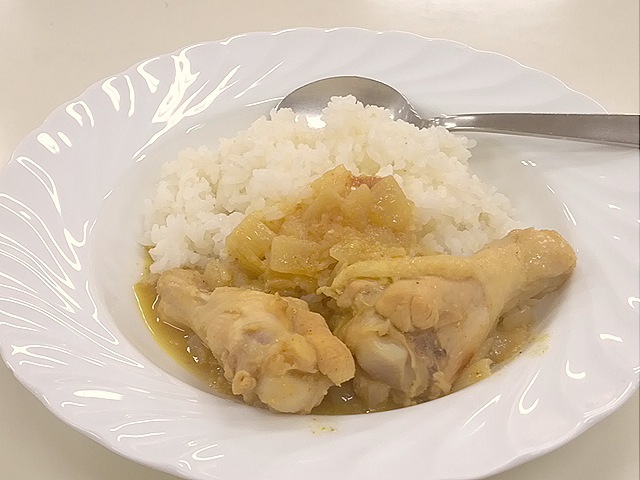 I decided to take the class again this year because the curry had been very delicious and unforgettable. 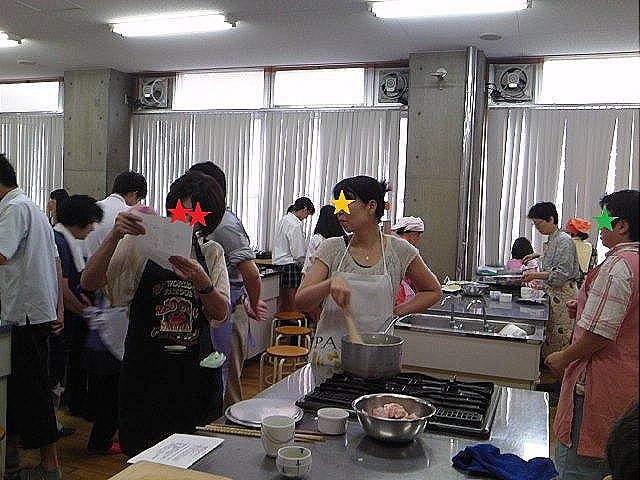 In the class, participants have to make teams for cooking together, and I found a woman who had cooked with me at the same group last summer was in my team. I was very happy to see her again and looked for a photo taken last year in my cell phone. The opening words were the woman’s when I showed her the last year’s photo. She was wearing the same shirt! What a coincidence! She was embarrassed, though our team mates and I found it interesting. We enjoyed cooking, laughing in such a good atmosphere. Of course, the curry was really delicious! We had a great time and promised to see each other at the Bangladeshi curry lass next year, too! The woman also promised to appear in the same shirt next time!